Pasadena in itself is big enough that you don’t feel a need to leave the city. They have Arclight for movies, Old Town for dining, and Target for everything else. 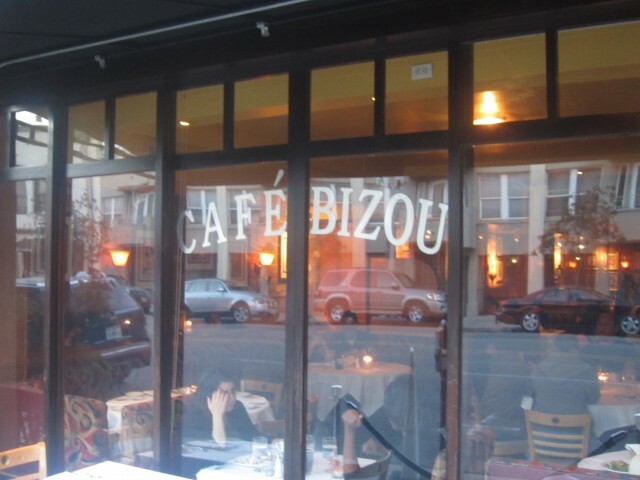 When Restaurant Week came around, Cafe Bizou caught my eye. Their menu was robust and was only one dollar sign ($25 for dinner). Interestingly, if it weren’t for Dine LA, I would have never heard of this restaurant. Tucked away near Pasadena City Hall, the entrance was small and could be driven by unnoticed. The inside was a bit dated, but seating arrangements were quite comfortable. The servers were quite attentive and helpful and knowledgeable about the menu. When I saw escargot on the menu as an appetizer, I had to order it. 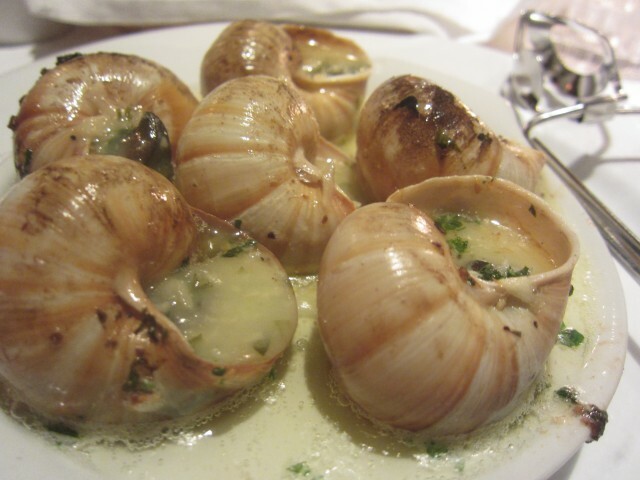 The escargot, burgandy snails were drenched in a garlic butter and topped with parsley. If you are scared or if the thought of eating snails is a bit off putting, don’t be. Though a land creature, think of these as sea creatures. I mean, the snails are similar to mollusks. They have a squishy center and hard shell — yes, to a non scientist, non biologist, that is my criteria for a mollusk. The taste and texture is like any other mollusk as well. It tastes kind of like clams, but chewier like a mussel. Either way, the garlic butter really helped mask any funkiness of the escargot. It was delicious and I would order these again. Their baked mushrooms were interestingly tasty. 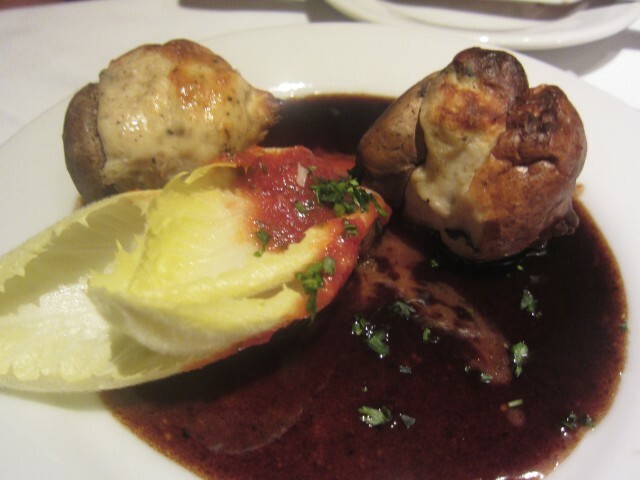 Stuffed with chicken and spinach mousse with a side of balsamic vinegar sauce, the appetizer was meaty. With endive on the side, everything came together nicely. The chicken was a chicken meatball and the flavors were robust. It was tasty and all, but I wish it was more creamy and warm. The whole dish was kind of single noted and was asking for more of a sauce than the balsamic reduction. A nice bubbly cheese covering would have been perfect. I ordered their seafood pasta — it had almost every seafood I could imagine. Filled with lobster, shrimp, and sea scallops the pasta was a treat. 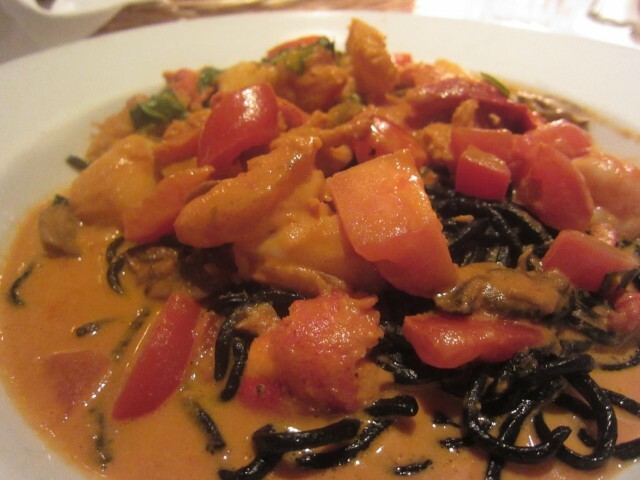 The black tagallini pasta was a first for me. Literally black in color, I was interested in how it was that color. I am guessing it was maybe squid ink? The pasta itself felt a bit reheated in some way and kind of crumbled, but still delicious. Covered in tomatoes and mushrooms in a lobster sauce, the pasta was quite heavy. In some way, the seafood lightened it up a bit. There was plenty of lobster and shrimp inside and the scallops were cooked perfectly. Nothing was overcooked — everything worked well in the dish. Their surf and turf on the menu was amazing at this price point. The petit filet minon was in a brandy cream and cooked perfectly medium. Their pan seared sea scallop was buttery and tasted so clean. 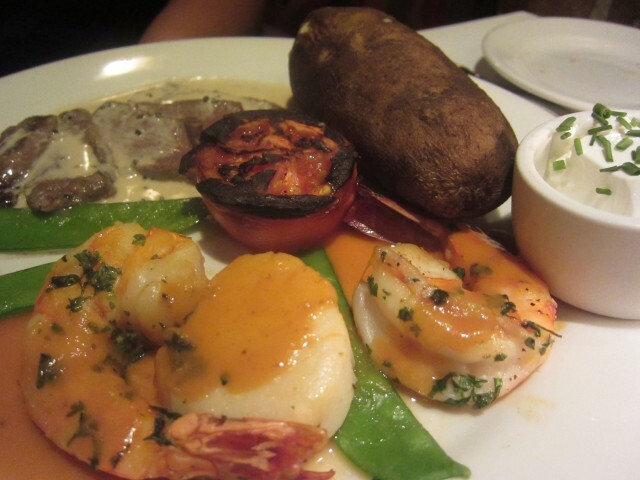 My favorite, the jumbo shrimp was cooked with so much flavor — the crust on the shrimp was delicious. With a baked potato and grilled tomato, the dish was complete. My only gripe about the dish was that the dish was all over the place. Plating made the dish look very mediocre, as if we got each individual item from a buffet. Despite the looks of the dish, the taste was what mattered. It isn’t restaurant week if it didn’t include dessert. We opted for the flourless chocolate cake and tiramisu. These two together was a perfect dessert in contrast. One was rich and chocolaty whereas the the tiramisu was light and creamy. 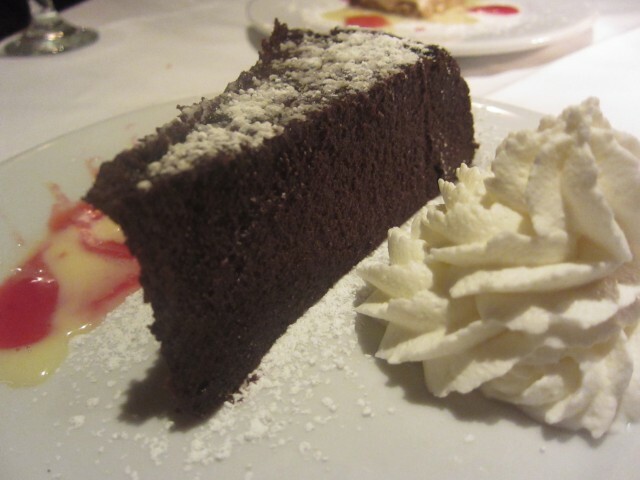 The flourless chocolate cake was moist and not too sweet — it was kind of boring though. It was just a wedge of chocolate tasting cake. The tiramisu on the other had was my favorite. It had a subtle coffee flavor and the creaminess was to die for. 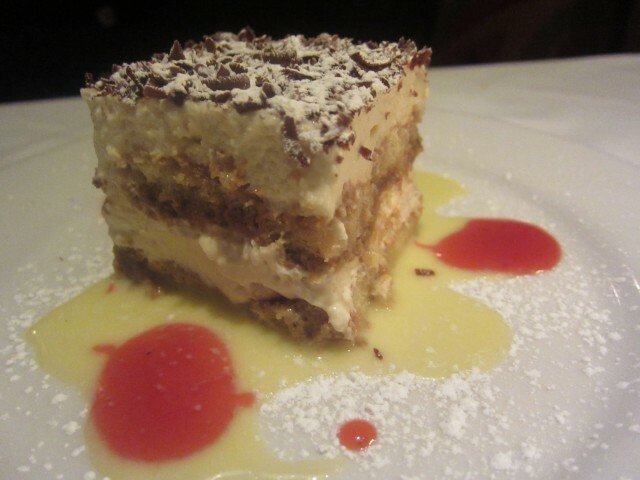 In hind sight, ordering two tiramisu would have been alright with me. I am still glad to have tried the chocolate cake. These two desserts were a perfect ending to a great dinner date. After experiencing Cafe Bizou, I don’t know if I liked it or not. The service was spotty and the overall experience at this restaurant could be forgotten, with the exception of the escargot and shrimp. I always think to myself, “If this restaurant were in Los Angeles, would it be considered something marvelous?” It is hard to say, especially with Los Angeles’ growing number of gastronomic eats — it would be safer left in Pasadena. I guess that is what you get. If you want more than mediocre, but not amazing, staying in Pasadena is fine. It is when you want that extra step above, the amazing and unforgettable — that is when you need to venture outside into Los Angeles. At any rate, Cafe Bizou was an awesome experience, again, in Pasadena standards. In Los Angeles terms, it will get blended in with the rest.